Over the years, we have collected numerous cleansing and detoxification testimonials from Jon Barron's natural detox program. 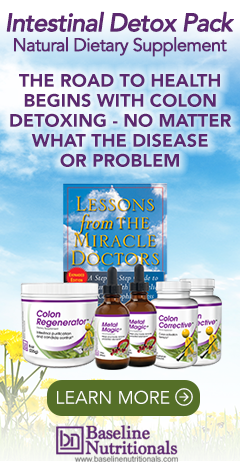 Below you are welcome to review both general and specific detoxification testimonials and an unbiased daily blog from health editor Steve Myers! "In the beginning on the liver detox I experienced mood swings, but then I was calmer. The morning garlic drink was not bad -- tasted like an Orange Julius. At first the tinctures tasted bad, but with organic vegetable juice, it tasted more like a Snappy Tom. "Both Jerry and I had a much easier time with the detox program this year. The detox schedule made it easy, especially when I was at work at lunch time and Jerry could just check out what he was supposed to do. It took a lot of guesswork out of when to do what because that drove me crazy last year. I know it doesn't have to be followed to the "T", but trying to sort out everything can be a challenge. "We were both able to lose weight, Jerry 10 pounds and I lost 8 pounds. It was all excess from the last two months of vacationing and the holidays, so we are glad it's gone. However, we are both determined to continue with a healthy eating plan and take off the rest this year. "It's hard to compare how I felt during the detox because I had a cold as well as a knee problem, so my mind was on other pains. The juice fasting was much easier than last year and my energy level was much better. Last time we didn't take the chlorella. Every morning after the drink my stomach was nauseous, but after about an hour everything was fine. We didn't get hungry. Jerry said it was really easy this year and he had no problems other than the desire to chew something (and to eat a handful of raw almonds). By the last day, though, we were really counting the hours for a salad, and looking forward to eating other food. Since we still haven't noticed real hunger, we realize how much of eating is just a habit. "This DETOX program was just awe inspiring. This is my second cleanse and my thanks to Jon for the DETAILED schedule; it really kept me on track. There is so much to remember that it was really helpful checking the schedule all day long to make sure I was getting everything. "This is my third time doing the full body detox and I must say it just gets easier and easier, but with the same amazing results. I always lose 8-10 pounds, but that is not why I do these. I feel lighter and my cravings for sweets has absolutely vanished. I don't want that glass of wine in the evening, any sugar, and I really am over any cravings for junk food. I am just amazed at how I always just am satisfied with lots of salads and vegetables and actually feel full with lots of energy. I hope to never stop my yearly detoxes!!!"